nce upon a midnight dreary I discovered the books of the prolific modern master Graham Masterton. My story is similar to that of many others. I picked up a copy of Death Trance at a local drugstore and I was hooked. Little did I know what I was in for. Graham Masterton has been writing books for over thirty years and his body of work includes over seventy books that have all been through multiple editions. I spent countless amounts of time pouring over the dusty contents of used booksellers, hoping somewhere in the back of an unorganized Horror section I would find a prize. Many days I wandered home unfulfilled. On other occassions I scored a copy of some long sought novel and rushed home to read in three or four hours what I had searched out for months. thought it would be interesting to put together a collection of scanned images of the cover art of my Masterton collection. The covers tell a story in themselves. Styles change as trends in cover design slowly wear themselves out, from grotesque and baudy to subtle and sublime. Obviously the credit for all of these covers go to the artists themselves. I have included the proper credits when I could locate them. I hope this will be a treat for Masterton fans like myself. I am always soliciting scans from others so please send along your scans. If you have books that are not included here (and there are many), please e-mail me and we can arrange to include them. Graham Masterton's new novel, A Terrible Beauty, is due out in March, 2003. The novel was originally titled 'Katie Maguire' and will be published as such in Poland. Check out the official site news section for more info. In the meantime, GM explained that the line 'A Terrible Beauty' was taken from the poem Easter 1916 by one of his favorite poets, W.B. Yeats. Click here or on the image above to read the poem! If that doesn't do it for you, check out the Proof cover for 'A Terrible Beauty' (thank you James Walls!) or the Poster for the Polish Release of Katie Maguire (Lars-Ove you are the man!). Got Horror? Graham Masterton was chosen as the Guest of Honor at the World Horror Convention taking place in, of all places, Kansas City, Missouri. Graham's new novel a Terrible Beauty will have been released by that point and there is also news of a booksigning at Barnes and Noble in St. Louis. If you live in the U.S. and want to meet the Manitou Man, this is probably your best chance! Stay tuned for more details on both A Terrible Beauty and the booksigning. Well, he's not back quite yet. Telos, publishers of the fantastic collection Urban Gothic, are putting together a limited edition 25th anniversary release of The Manitou. The book will contain both the original and alternate endings and is due out on Halloween. This is a must for all Masterton fans. You can pre-order it now on the Telos site. Remember that the Braham Stoker nominated Urban Gothic is available now for order. Click Here to read Graham Masterton's poetry from the anthology Sprouts on Helicon. Masterton has an amazing poetic sensibility as is evidenced in these evocative poems dating from his High School years. This poetry is re-printed with the kind permission of the author. Thanks to Kevin Etheridge for the text! By the way, the 'T' in Graham T. Masterton stands for Thomas, his grandfather's first name. Bruce Thomas, the infamous "Dark Father" of Horrornet and Graham Masterton Message Board fame has kindly provided me with photos of his Bookcase From Hell. I wouldn't even want to try and quantify all the horrible situations, pain and suffering contained within those shelves. But goodness and the human spirit always triumph in the end. Don't they? A very impressive collection. ilm director Mariano Baino is complaining he has not time to do his filmmaking duties because he has been so busy scanning covers for this site. His loss, our gain. I should actually start calling this site 'Mariano Baino Presents the Covers of Graham Masterton'. Mariano has been slaving over the scanner and his hard work has made this site about 100% better. I must say it's quite an honor getting these scans from the person charged with translating Ritual to the big screen. As Ritual proceeds, I'll try to get poster artwork and publicity shots for the film and post them here. Thanks Mariano! If you came across this site whilst searching the Internet for information on Graham Masterton, please make sure to visit his official website. There is a message board on the site which Graham Masterton visits daily during the week. You can get an opportunity to interact with both the author and other fans. GM has trivia contests, giveaways and sometimes sells limited merchandise. I got the photo above, a professional 8x10 headshot signed with a personalized message, by being lucky enough to check the board at the right time. Graham only had ten copies made and I got it for a steal! Just in... Mariano Baino has kindly allowed me to post a concept sketch from his upcoming feature based on GM's book Ritual. Check out this CAOGM exclusive feature! I have added the original cover artwork for the upcoming Cemetery Dance novella 'Bonnie Winter'. The artwork is posted with the kind permission of the artist Keith Minnion. I have included some text from an e-mail from Minnion in which he describes the ideas behind the artwork. Thank you Keith! We have added an advice expert to our staff. Our newest feature will get you the life advice you need from someone who's lived several of them. Need help with your girl, advice on the stock market? Ask Misquamacus! Beware, he can be a bit grumpy at times. This section contains thank yous and shout outs to some of those who have dug into their private collections, fired up their scanners and made this site what it is. A very sincere thank you to you all. I have completed uploading the many scans of Kent Songer. Kent was kind enough to send me over forty scans of his Masterton collection. This is exactly what I was hoping would happen as GM fans around the world start to contribute to this Archive du Masterton. Check out some of the new covers including such rarities as Hurry Monster. Kent also sent along an alternate cover which won third place in our alternate cover contest. Mag Read has sent us some tasty editions of GM including 5 paperbacks published by Sphere which look like part of a matched set and an incredible papaerback copy of Plague from Star Books. Very cool stuff Mag. Thank you very much for sending along the scans! Julie Graves aka Darksecretz has sent us some wonderful covers recently, the scanning of which resulted in the death of her scanner. May it rest in peace. Check out her contributions, including a very cool copy of The Devils of D-Day and Silver. Matt Williams, co-author of 'Manitou Man' sent us a polish edition! Check it out here. Now polish editions of GM's books are something I would love to see more of. Thanks Matt. Also check out a very, VERY interesting Matt Williams prompted thread which contains GM giving tips on writing techniques on the Official Graham Masterton message board. John Mason has also sent us some wonders from his collection of UK editions. John had to borrow a scanner to create the scans, for which we are all very appreciative. Be sure to look at Walkers and Charnel House for John's cover scans. Also check out the great french edition of Swimmer John obtained from the man himself for being a Masterton trivia master! Lars-Ove Karlsson sent in some Swedish editions of GM's books. Very interesting to see. Check out Charnel House and The Manitou to see some of them. Thank you Lars-Ove and yes, you are correct, Masterton Rules! Victoria Hampshire helped us all out by sending in scans of the covers of the two Rook Omnibus editions. Check out Snowman and The Terror and Rook and Tooth and Claw. Thanks Vicks! A new feature has just been added. It's basically a tutorial on how to find and purchase Graham Masterton's books. This is a definite must-see for newbies and even folks who have been buying GM's books for a while might learn a thing or two. Check it out and if you have any questions, e-mail me. I added another feature today. A forum called My Favorite Masterton. The idea is this is a place for fans to highlight their favorite Masterton books or snippets of prose. I started with some great quotes from an early novel. I know that this may not catch on, but I am definitely of the 'build it and they will come' school. I have been tinkering with a new idea for this site, Graham Masterton fan fiction. That is, taking the characters and worlds of Graham Masterton and using them in your own stories. It's a huge universe to choose from. 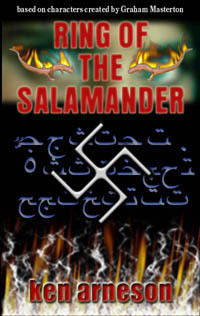 I have been working on a mini-sequel to The Burning called Ring of the Salamander. Find out what happens when Lloyd Denman comes face to face with two allies in evil. I have completed six chapters and will do more if there is interest. Please e-mail me your fan fiction and I will post it here!!! The Alternate Cover Contest from earlier this year turned out to be a lot of fun. If you are unfamilair with this contest, Graham's fans came up with their own versions of covers for his books and the author judged the entries. First, second and third place were awarded along with prizes to boot! I'm going to try and do this again soon. The biggest problem is getting people to let their artistic inhibitions go and enter without fear of not measuring up. I'm no artist but I had a great time doing this. If you get a chance, please sign my guestbook and leave any sort of message you would like be it profane and threatening or puppies and cotton candy sweet. I love to hear from the folks who stop by. Guestbook. I am adding what I like to hope to think will be The Ultimate List of Masterton Links. I think if all goes well we will someday get there. Nothing wrong with thinking big and starting small, I always say. If you have any interesting links, e-mail me. The navigation scheme has been updated so you can move from page to page without having to come back to the list. Notice the arrows on the bottom of each page. This site is in no way authorized by the author or the publishers of the books included. I have included multiple links to The Official Graham Masterton Website a wonderful repository of all things Masterton including a complete biography and bibliograhy. Now, on to the covers!